Now a Northwestern University team has used materials science to solve this age-old problem. The team has leveraged super material graphene to develop a new hair dye that is less harmful, non-damaging and lasts through many washes without fading. Graphene’s conductive nature also opens up new opportunities for hair, such as turning it into in situ electrodes or integrating it with wearable electronic devices. The study was published online today (March 15) by the journal Chem. Jiaxing Huang, professor of materials science and engineering in Northwestern’s McCormick School of Engineering, led the research. Huang and his team bypassed harmful chemicals altogether by leveraging the natural geometry of graphene sheets. 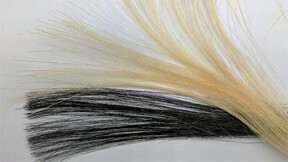 While current hair dyes use a cocktail of small molecules that work by chemically altering the hair, graphene sheets are soft and flexible, so they wrap around each hair for an even coat. Huang’s ink formula also incorporates edible, non-toxic polymer binders to ensure that the graphene sticks -- and lasts through at least 30 washes, which is the commercial requirement for permanent hair dye. An added bonus: graphene is anti-static, so it keeps winter-weather flyaways to a minimum. Ever since graphene -- the two-dimensional network of carbon atoms -- burst onto the science scene in 2004, the possibilities for the promising material have seemed nearly endless. With its ultra-strong and lightweight structure, graphene has potential for many applications in high-performance electronics, high-strength materials and energy devices. But development of those applications often require graphene materials to be as structurally perfect as possible in order to achieve extraordinary electrical, mechanical or thermal properties. The study is titled “Multifunctional graphene hair dye.” Chong Luo and Lingye Zhou, members of Huang’s laboratory, are the paper’s co-first authors.